Biodiesel production from marine microalgae has received much attention as microalgae can be cultivated on non-arable land without the use of potable water, and with the additional benefits of mitigating CO2 emissions and yielding biomass. However, there is still a lack of effective operational strategies to promote lipid accumulation in marine microalgae, which are suitable for making biodiesel since they are mainly composed of saturated and monounsaturated fatty acids. Moreover, the regulatory mechanisms involved in lipid biosynthesis in microalgae under environmental stress are not well understood. In this work, the combined effects of salinity and nitrogen depletion stresses on lipid accumulation of a newly isolated marine microalga, Chlamydomonas sp. JSC4, were explored. Metabolic intermediates were profiled over time to observe transient changes during the lipid accumulation triggered by the combination of the two stresses. An innovative cultivation strategy (denoted salinity-gradient operation) was also employed to markedly improve the lipid accumulation and lipid quality of the microalga, which attained an optimal lipid productivity of 223.2 mg L-1 d-1 and a lipid content of 59.4% per dry cell weight. This performance is significantly higher than reported in most related studies. This work demonstrated the synergistic integration of biological and engineering technologies to develop a simple and effective strategy for the enhancement of oil production in marine microalgae. Fossil fuels now contribute most of the global energy demand, but these fuels are directly associated with the greenhouse effect and environmental pollution . Oil reserves may run out after 2050 due to the fast growth in fossil fuel-requiring human activities worldwide [2, 3]. Therefore, huge efforts are being made in developing CO2 fixation and reduction technologies and in finding alternative and renewable energy sources . Among those attempts, biodiesel has received significant attention since it is made from nontoxic and biodegradable materials, and its use leads to a huge decrease in the emissions of greenhouse gases (such as CO2) and air pollutants . However, to produce enough biodiesel from oleaginous crops (such as soybean, palm, and rapeseed) to supply the existing demand for transportation in the United States alone, displacement of around 50% of its total cropland would be necessary. This would cause severe problems such as food shortages . Therefore, there is an urgent need to identify more effective and sustainable oil feedstocks for making biodiesel to meet the global demand. Microalgae are considered a renewable alternative biodiesel feedstock due to their high growth rate, relatively high lipid content, and excellent CO2 fixation ability compared to other candidates [5, 7]. Under appropriate environmental stress some microalgal species such as Chlorella emersonii, Chlorella minutissima, Chlorella protothecoides, Chlorella vulgaris, Neochloris oleabundans, and Dunaliella tertiolecta can accumulate up to 50 to 70% of lipid per dry weight of biomass, and the resulting lipid composition is suitable for making biodiesel [7–9]. However, for large-scale microalgal cultivation, a tremendous amount of water is required. This would raise the problem of a shortage of available water resources if freshwater is used to grow microalgae without efficient recycling of the spent water [10, 11]. Therefore, marine microalgal strains that could grow in brackish water or seawater have clear advantages over freshwater algae in terms of water usage and could be a more reliable and economic feedstock for microalgal-based biodiesel production. In addition, some critical biological features such as growth rate, lipid content, and lipid composition are crucial for justifying the feasibility of using microalgae to produce lipids for biodiesel synthesis. Thus, selecting a marine candidate with rapid growth, high lipid content, and appropriate lipid composition is essential. Several marine microalgae have been considered as potential biodiesel producers due to their characteristics of high salt tolerance and high lipid content. These species include Chlorella sorokiniana , Nannochloropsis sp. F&M-M24 , Nannochloropsis gaditana , D. tertiolecta ATCC30929 , and C. protothecoides . The production of microalgal lipids is often triggered by environmental stress such as nitrogen depletion . However, operation under stress conditions is always associated with relatively low cell growth, thereby leading to low lipid productivity [5, 16, 17]. Many studies have reported that growth rate and lipid accumulation in microalgae are significantly influenced by culture conditions (such as irradiance, salt concentration, and medium selection) [14, 18, 19] and operational strategies (such as two-stage cultivation, semi-batch cultivation, or continuous cultivation) [5, 10, 12, 20]. Although the information provided in the literature indicates that lipid production from microalgae could be improved by applying suitable operational strategies and conditions, a systematic analysis on how to optimize lipid productivity and on the metabolic mechanism behind the improvement in lipid accumulation is still lacking. In particular, lipid production using marine microalgae has been little studied. Metabolic profiling analysis has proven to be a powerful tool for gaining insights into functional biology in recent years . The comprehensive analysis of a wide range of metabolites in microorganisms using high-sensitivity mass spectrometry techniques makes it possible to identify targeted metabolites that play important roles in specific biological processes . This makes metabolomics a perfect approach to explore why lipids are accumulated under particular stress conditions. However, metabolomics tools have not yet been widely applied to investigating lipid-producing microalgae. Therefore, we used applied metabolomics to observe the main metabolite profiles of the target lipid-producing microalgae during cultivation under the combined environmental stresses of salinity and nitrogen depletion. In this study, a newly isolated microalgal strain identified as Chlamydomonas sp. JSC4 was used as a candidate oil producer. A variety of culturing conditions, including various media, salinity, and nitrogen depletion were examined to optimize lipid productivity. In addition, the metabolic profile of Chlamydomonas sp. 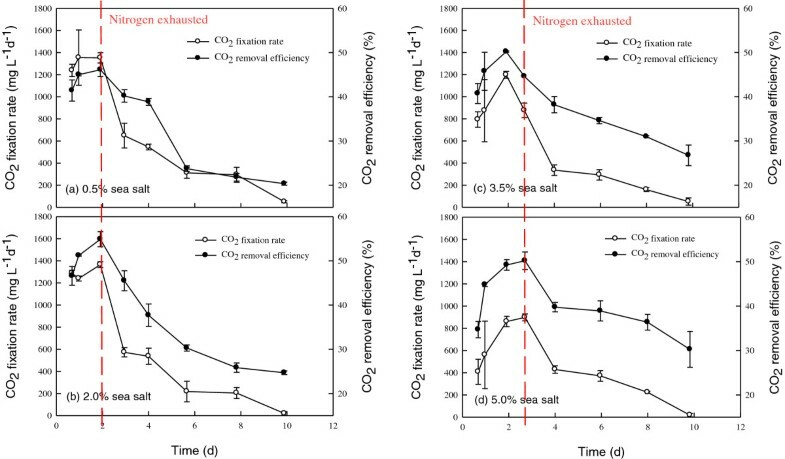 JSC4 under salt stress and nitrogen depletion was monitored to identify the intercorrelations among salinity, nitrogen depletion, and lipid synthesis. Finally, various engineering strategies (namely two-stage and salinity-gradient operations) were applied to optimize the lipid productivity of the JSC4 strain. In particular, salinity-gradient operation is a novel method that is, in principle, applicable to any other marine microalgal strain as long as it shows some salinity tolerance. Thus, this study demonstrates an effective combination of biological and engineering technologies enabling the rapid accumulation of lipid in a target marine microalga to meet the demand for biodiesel feedstock. The growth rate and cellular composition of microalgae varies significantly depending on the composition of their growth medium . To select a suitable medium for the growth and lipid accumulation of Chlamydomonas sp. JSC4 after pre-culturing on Modified Bold 3 N medium, five commonly used media (basal medium 1/3 N, Modified Bristol 1/2 N medium, BG11 1/4 N medium, Modified Bold 3N medium, and high salt 1/2 N medium) were used to grow the JSC4 strain for lipid accumulation. The nitrogen and sea salt concentrations in each medium were fixed at 4.4 mM and 2%, respectively, to normalize the effects of the medium composition on cell growth and lipid accumulation. All cultures were grown for around two days under nitrogen-rich conditions. As shown in Figure 1, the biomass concentration, specific growth rate, and CO2 fixation rate of the JSC4 strain were quite similar under the five media examined, suggesting that the strain can grow well within a wide range of major nutrients and trace metals, showing a strong possibility of growing this strain in an outdoor system using wide range of water resources. Performance of Chlamydomonas sp. JSC4 cultivated on different growth media based on cell growth, CO 2 fixation, and lipid accumulation. 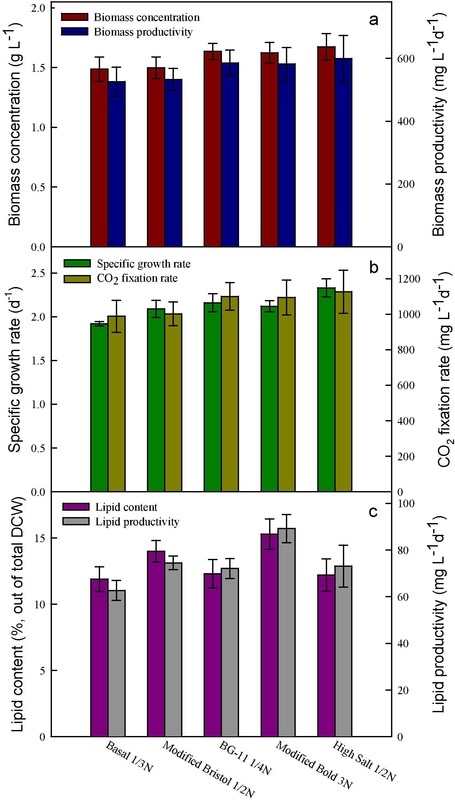 (a) Biomass concentration (g L-1) and biomass productivity (mg L-1 d-1), (b) specific growth rate (d-1) and CO2 fixation rate (mg L-1 d-1), and (c) lipid content (%) and lipid productivity (mg L-1d-1). Error bars indicate standard deviation of three replicated experiments. (Light intensity = 200 μmol m-2 s-1; CO2 aeration = 2.0%; CO2 flow rate = 0.05 vvm). Figure 1 also indicates that different media slightly influenced the lipid content of the microalgal strain, as the highest lipid content (15.3%) and lipid productivity (89.2 mg L-1d-1) were obtained when it was grown on Modified Bold 3 N medium. According to these results, Modified Bold 3 N medium was used in the following experiments. It is commonly believed that lipid productivity is the most important indicator for microalgal lipid production, since higher lipid content would benefit downstream extraction. The total cost of chemicals in the medium is also a vital consideration for the practical scale-up of cultivation. As indicated in Table 1, mediums Modified Bold 3 N and BG11 1/4 N cost the least among the five media examined and are thus the most economic medium for microalgal cultivation. However, under the cultivation conditions used in these tests, the highest lipid content and lipid productivity (15.3% and 89.2 mg L-1d-1, respectively) were unsatisfactory compared to other relevant studies [12, 13, 16]. Further improvement in the lipid production of this strain was necessary and is described in the following sections. The values are the mean ± standard deviation of three replicated experiments. (Light intensity = 200 μmol m-2 s-1; CO2 aeration = 2.0%; CO2 flow rate = 0.05 vvm). *The price of media was evaluated using industrial-gradient nutrients purchased from local manufacturers. Although the lipid content of a microalga appears to be species-specific, most oleaginous microalgae produce only a small quantity of lipids under conditions favorable for their growth . To enhance lipid accumulation in microalgae, environmental stress (in particular, nitrogen depletion) is often employed to stimulate lipid synthesis . Hu et al. reported that of all the nutrients evaluated the nitrogen source is the most critical factor affecting lipid synthesis in microalgae . A number of studies have demonstrated that nitrogen depletion leads to a significant increase in lipid content in microalgae, which is accompanied with a drop in protein content. It is likely that the stress of nitrogen depletion forces the microalgae to transform protein or peptides to energy-rich compounds (such as lipids or carbohydrates) [2, 24]. Thus nitrogen depletion was also used to promote lipid production in the JSC4 strain. As shown in Figure 2, when the microalga was grown on Modified Bold 3 N medium, a three-day nitrogen depletion resulted in a decrease in the protein content from 45.4 to 17.9%, whereas the lipid content increased dramatically from 15.3 to 41.1%. However, when using the other four media to grow strain JSC4, a three-day nitrogen depletion resulted in an improvement in the lipid content, which increased to 24.1, 35.7, 36.0, and 34.8% for basal 1/3 N, Modified Bristol 1/2 N, BG11 1/4 N, and high salt 1/2 N medium, respectively (Table 1). These results indicate that nitrogen depletion can dramatically increase the lipid content of strain JSC4 but has less impact on carbohydrate accumulation (data not shown). When microalgae undergo environmental stress like nitrogen depletion, either the lipid or carbohydrate metabolic pathway is often triggered, but to which energy-rich products (lipids or carbohydrates) the carbon is predominantly allocated is species dependent . There also appears to be competition between lipid and starch synthesis when microalgae undergo nitrogen depletion . Biochemical composition of Chlamydomonas sp. JSC4 cultivated on Modified Bold 3 N medium under (a) nitrogen-rich (70 to 80% nitrogen consumed) and (b) nitrogen-depleted conditions (three-day nitrate depletion). (Light intensity = 200 μmol m-2 s-1; CO2 aeration = 2.0%; CO2 flow rate = 0.05 vvm). The quality of biodiesel can be based on its ratio of saturated to unsaturated fatty acids (FAs) . The saturated FA content in biodiesel can increase its resistance to oxidation under high ambient temperatures, while unsaturated FAs can maintain fluidity at low temperatures . A similar amount of saturated and unsaturated fatty acids is important in order to obtain biodiesel with appropriate properties at low temperature and high oxidative stability . The FA profile is affected by environmental stress arising from nutrient limitations, temperature, salinity, and light intensity [15, 23]. 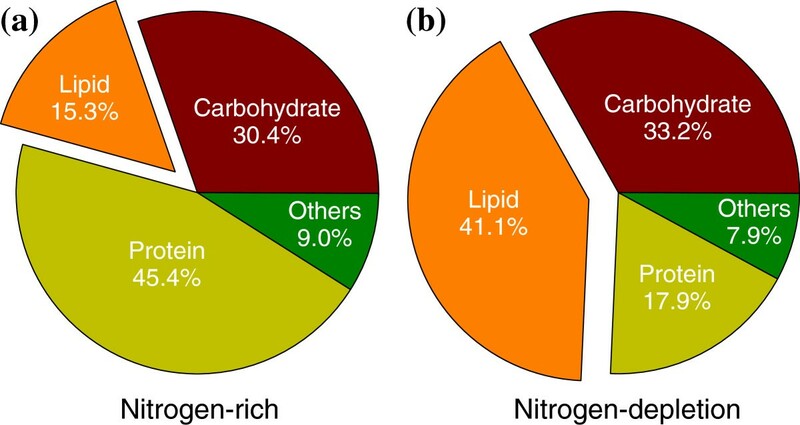 Among these stresses nitrogen depletion is the most critical factor affecting the lipid metabolism of microalgae and its effects have been observed in numerous microalgal species [7, 9, 23]. As indicated in Table 2, when undergoing nitrogen depletion the lipid accumulated in strain JSC4 tended to contain more oleic acid (C18:1), while the linolenic acid (C18:3) content sharply decreased. In terms of biodiesel properties, oils containing a higher percentage of oleic acid provide better oxidation stability with a suitable cold filter plugging point in cold weather . In addition, based on the European Biodiesel Standard EN14214, the content of linolenic acid (C18:3) is limited to a maximum of 12% . Thus, the lipids produced by Chlamydomonas sp. JSC4 seem to have suitable qualities for making biodiesel. Moreover, in contrast to soybean oil, strain JSC4 showed a significantly higher saturated FA content and a lower polyunsaturated FA content, as shown in Table 2. In general, a higher extent of saturation in lipids results in greater viscosity and density of the derived biodiesel, while lower percentages of polyunsaturated FAs can increase the oxidation stability and also result in an appreciable cold filter plugging point in cold regions . Thus, due to having suitable FA profiles in its lipids, Chlamydomonas sp. JSC4 seems to be a promising feedstock for biodiesel production. Many microalgae species can synthesize a large amount of lipids as storage products in response to unfavorable environmental conditions for growth, such as high light intensity , nutrient (mainly nitrogen) depletion , and high salinity . In particular, for marine microalgae, salinity is an important factor affecting lipid content. Increases in salinity may result in a significant increase in the lipid content of several microalgal species, including Chlorococcum sp. , Dunaliella sp. , Botryococcus braunii , Chlorella protothecoides , and Nannochloropsis sp. . A salinity control strategy to promote lipid production of microalgae is very easy to operate but has been little studied for effects on lipid accumulation when combined with nitrogen limitation. Since strain JSC4 is a marine microalga, it is of great interest to know whether salinity control could further enhance its lipid productivity, and more importantly to understand the possible synergistic effects when both salinity control and nitrogen depletion are employed. In addition, it is also necessary to explore appropriate timing in harvesting the cultured microalgae so that optimal lipid production efficiency can be obtained. In this study, the JSC4 strain cells were cultivated under various sea salt concentrations (0.5, 2.0, 3.5, and 5.0%) for 10 days under nitrogen-depleted conditions with regular monitoring of biomass production, nitrate concentration, lipid content, and lipid productivity. 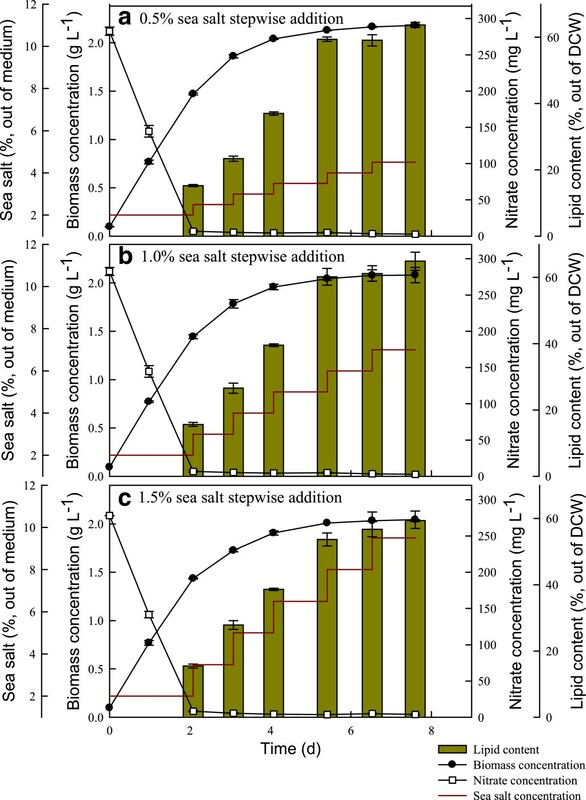 As shown in Figure 3 and Table 3, the final biomass concentration decreased slightly when raising the sea salt concentration from 0.5 to 5.0%, suggesting that high salt stress only slightly inhibits cell growth, due to the salt tolerance of strain JSC4. Inhibition of cell growth of microalgae by high salinity is commonly observed. For instance, Takagi et al. reported that an extremely high salinity of 1.5 M markedly decreases the cell growth of Dunaliella sp. . However, our results show that the lipid content increased significantly with the increase in sea salt concentration in the stationary phase. This indicates that high lipid content might not only come from salt stress but also from nitrogen limitation. Therefore, as observed by Pal et al., combining more than one environmental stress (such as simultaneous high salinity and nitrogen depletion) may further enhance lipid accumulation in microalgae . As shown in Table 3, after a seven-day nitrogen depletion, the highest lipid content resulting from cultivation at respective sea salt concentrations of 0.5, 2.0, 3.5, and 5.0% were 38.7, 53.5, 55.1, and 64.0%, respectively. In particular, through combining the stress of 5% sea salt and nitrogen limitation, the lipid content increased markedly from 14.5 to 64.0%, which is approximately a 4.4-fold enhancement. Unfortunately, the cell growth rate under high salinity could not be maintained as well as under low salinity, resulting in lower lipid productivity (Table 3). Thus, in order to enhance the potential of producing lipids from strain JSC4, the lipid productivity should be significantly improved by appropriate engineering strategies. Time course profiles of nitrate concentration, lipid content, and lipid productivity during growth of Chlamydomonas sp. JSC4 on Modified Bold 3 N medium under the sea salt concentration of (a) 0.5%, (b) 2.0%, (c) 3.5%, and (d) 5.0%. Error bars indicate standard deviation of three replicated experiments. (Light intensity = 200 μmol m-2 s-1; CO2 aeration = 2.0%; CO2 flow rate = 0.05 vvm). DCW, dry cell weight. Figure 4 depicts the time course of CO2 capture of the JSC4 strain under different salinities. 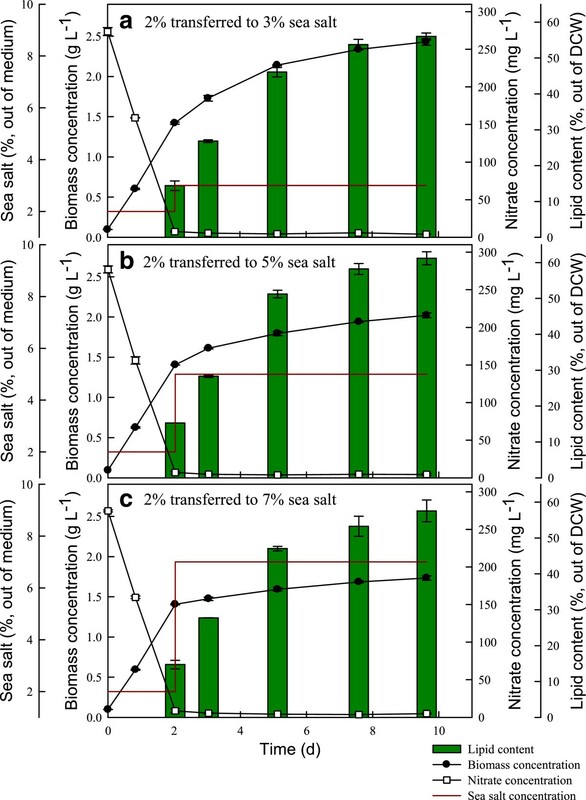 The trends in CO2 fixation rate and CO2 removal efficiency under different sea salt concentrations were very similar throughout the course of the experiments, revealing low values at early and late cultivation periods, while reaching the highest values after cultivation for between two and three days. Similar trends were observed in our previous study , and the relationship between cell growth and CO2 fixation can be represented as a bell-shape curve. During the optimal time period indicated in Figure 4 and Table 3, the maximum CO2 removal efficiency and CO2 fixation rate (obtained with 2% sea salt) were 54.9% and 1319.0 mg L-1d-1, respectively, which were values superior to most of the relevant studies . This excellent performance in CO2 fixation makes strain JSC4 a candidate for the practical CO2 fixation of industrial flue gas. It should be noted that the high CO2 fixation rate occurs when the microalgae grow very fast. During this fast growth period, lipid accumulation is usually insignificant (Figure 4 and Table 3). Therefore, normally a follow-up lipid accumulation operation (such as nitrogen depletion) should be conducted for the cells obtained from CO2 fixation to ensure high lipid production. However, as shown in Table 3, the highest lipid productivity of 158.9 mg L-1d-1 was obtained when the CO2 fixation rate was 712.9 mg L-1 d-1 (with 2% sea salt), a value superior to the performance of most other green microalgae under batch cultivation systems . 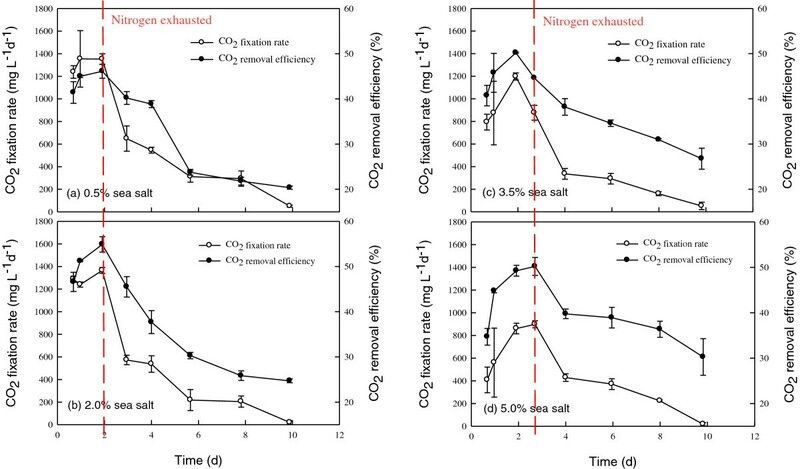 Time course profiles of CO 2 fixation rate and CO 2 fixation ability during growth of Chlamydomonas sp. JSC4 on Modified Bold 3 N medium under the sea salt concentration of (a) 0.5%, (b) 2.0%, (c) 3.5%, and (d) 5.0%. Error bars indicate standard deviation of three replicated experiments. (Light intensity = 200 μmol m-2 s-1; CO2 aeration = 2.0%; CO2 flow rate = 0.05 vvm). 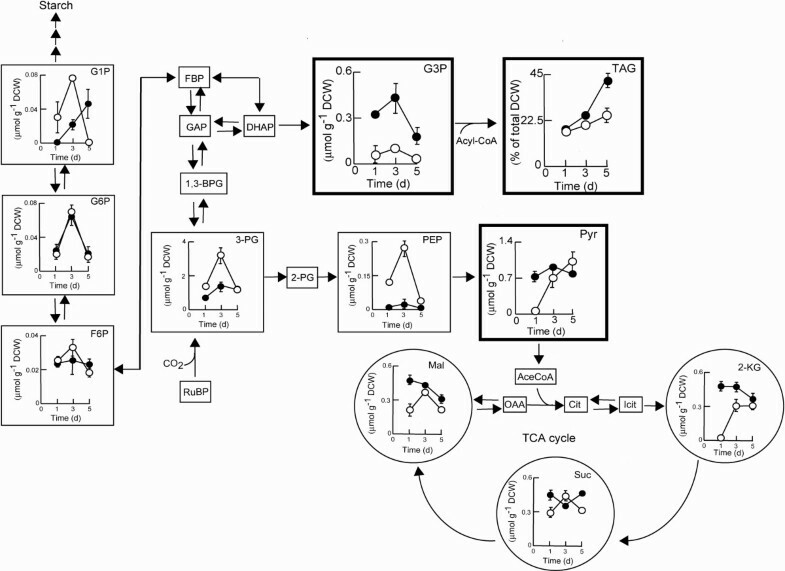 To investigate the metabolic pathways of interest for lipid production, metabolite profiling appears to be a well suited method to monitor numerous changes of metabolite levels in response to various environmental stimuli . However, the metabolic pathways involved in storage lipid accumulation in microalgae are poorly studied compared to higher plants . Several environmental stresses, including nitrogen depletion and high salinity, have been used to increase the production of microalgal lipid . However, little is known about the mechanism of lipid synthesis in microalgae under salt stress. To the best of our knowledge, this is the first report following the metabolic profiles of microalgae cultivated under the combined stresses of salinity and nitrogen depletion. Intracellular metabolites were extracted and identified using capillary electrophoresis coupled with mass spectrometry (CE/MS) and variations in the amount of various metabolites over time were determined. Figure 5 clearly shows that under nitrogen sufficient conditions (on day one), the levels of most triglyceride synthesis-related metabolites (glycerol-3-phosphate (G3P)) under salt stress were significantly higher than those in freshwater cultures. It has been reported salt-adding would significantly cause the osmotic stress in the medium which results in a dramatic accumulation of glycerol in the microalga Chlamydomonas reinhardtii . Moreover, it is known that G3P is an extremely important metabolic intermediate for the synthesis of glycerol in many microorganisms used as a precursor for triacylglyceride . Therefore, this phenomenon suggests that a positive relationship between G3P formation and triacylglyceride synthesis in microalgae under osmotic stress caused from adding salts existed; suggesting osmotic stress could obviously trigger the formation of G3P and further promote the synthesis of triacylglyceride. In addition, several key metabolites involved in the Calvin cycle (fructose-6-phosphate, 3-phosphoglyceric acid, and phosphoenolpyruvic acid), or tricarboxylic acid cycle (2-ketoglutaric acid) exhibited a significant increase until reaching their highest value at day three, suggesting that nutrients such as nitrogen in the medium or inside the cells might be sufficient to maintain cell viability. On the other hand, after nitrogen depletion for three days (day five), the levels of most of these metabolites tended to decrease, mainly due to the storage of energy compounds in the form of triacylglycerides (Figure 5). Moreover, an obvious increase in glucose-1-phosphate (G1P) under salt stress was observed, indicating that under certain environmental stresses, strain JSC4 may also store a certain amount of starch. Other studies reported an increased amount of lipids in starchless mutants of Chlorella pyrenoidosa  and in C. reinhardtii , suggesting a competition between lipid and carbohydrate synthesis. Therefore, blocking the carbohydrate biosynthesis pathway of JSC4 has the potential to further boost triacylglyceride production. Time course analysis of metabolite content of Chlamydomonas sp. JSC4 cells cultivated on Modified Bold 3 N medium with (closed circles) or without (open circles) 2% sea salt. Error bars indicate standard deviation (n = 3). Notably, cultivation under conditions of nitrogen depletion led to a dramatic accumulation of pyruvate in freshwater cultures. This may be caused by the markedly slower accumulation rate of intermediates (such as 2-ketoglutaric acid, succinate, and malate) in the tricarboxylic acid cycle, thus restricting lipid synthesis . In contrast, the amount of pyruvate remained almost constant under salt stress, which is in good agreement with the efficient accumulation of lipid shown in Figure 3. Furthermore, large amounts of G3P appear at an earlier stage of nitrogen depletion under salt stress when compared with that in freshwater. Dulermo and Nicaud  reported that modification of the G3P shuttle in Yarrow lipolytica improved lipid accumulation. These findings indicate that triacylglyceride synthesis may be limited by the availability of G3P and pyruvate. Using CE/MS, the relevant metabolism of strain JSC4 could be successfully profiled, and the information obtained can be applied to future genetic engineering of the lipid synthetic pathway. Although strain JSC4 is a promising feedstock for biodiesel production, its lipid content and lipid productivity should be further improved via various engineering strategies. Batch operations under high salt stress indicated that nitrogen depletion raised the lipid content dramatically, but also caused a significant decrease in biomass production, which is unfavorable to overall lipid productivity. In contrast, lipid accumulation under a combination of nitrogen depletion and low salt stress was not satisfactory, even though cell growth was slightly better under these conditions, as shown in Table 3. To avoid the above problems a two-stage cultivation strategy has been widely reported to improve lipid production [5, 42]; however, very few studies have focused on salt as a stimulant in a second stage to enhance lipid accumulation of microalgae . In this strategy, a nutrient-rich medium with 2% sea salt was used in the first stage, allowing cell growth, for approximately two days. After over 95% of the nitrate was consumed the culture was transferred to a nitrogen limited medium amended with 3, 5, or 7% sea salt to enhance lipid accumulation. As shown in Figure 6 and Table 4, after switching to the second stage for seven days, the lipid content of strain JSC4 in the presence of 3, 5, and 7% sea salt reached nearly 56, 61, and 58% (w/v), respectively, which is approximately four times higher than that obtained in the first stage (in which the lipid content was around 15%). Moreover, it was clear that the lipid content tended to increase slightly along with rising sea salt concentration, reaching the highest value of 61.2% in the presence of 5% sea salt. However, a further increase in sea salt concentration to 7% did not lead to a further increase in lipid content. Instead, it resulted in a slight drop in lipid content. This finding is consistent with a recent report showing that extremely high salinity strongly decreases lipid accumulation ability . Thus, a two-stage cultivation strategy can significantly enhance the lipid content of strain JSC4, with a yield higher than that obtained in batch operation or in related studies (Table 4). However, the biomass productivity is markedly lowered by abruptly switching to a high salinity environment, probably as a consequence of poor cell growth. As a result, the highest lipid content (61.2%) was achieved when the second stage was performed at 5% sea salt, while the highest lipid productivity (183.9 mg L-1 d-1) was obtained when the second stage was performed at 3% sea salt. Therefore by properly adjusting the salinity in the second stage the optimal lipid production can be achieved. Time course profiles of biomass concentration, nitrate concentration, and lipid content during the growth of Chlamydomonas sp. JSC4 on Modified Bold 3 N medium before and after transfer to high-salinity conditions of (a) 3%, (b) 5%, or (c) 7% sea salt. Error bars indicate standard deviation of three replicated experiments. (Light intensity = 200 μmol m-2 s-1; CO2 aeration = 2.0%; CO2 flow rate = 0.05 vvm). DCW, dry cell weight. Before transfer to high salinity, the cultures were grown with 2% sea salt for around two days. The values are the mean ± standard deviation of three replicated experiments. (Light intensity = 200 μmol m-2 s-1; CO2 aeration = 2.0%; CO2 flow rate = 0.05 vvm). The results shown above indicate that cultivation of strain JSC4 under high salinity is likely to enhance the lipid content but lower the growth rate. To achieve higher lipid productivity, which is the major indicator of lipid production from an engineering aspect, the growth inhibition due to salinity stress should be alleviated. Several attempts have been made to achieve this goal. For example, Takagi et al. gradually increased the salt concentration to allow for the adaptation of microalgae to high salinity . Therefore, using high salinity stress to stimulate lipid accumulation of microalgae and maintaining a satisfactory cell growth rate (for example, by enhancing adaptation to salinity) seems to be a promising strategy to enhance lipid content and lipid productivity simultaneously. This concept was realized in this study by means of salinity-gradient operations. Before employing the salinity gradient, the JSC4 strain was cultivated in batch mode until over 95% of the nitrogen source was consumed. At this point, the highest biomass productivity is approximately achieved. The operation was then switched to salinity-gradient mode by a stepwise increase in the sea salt concentration in increments of 0.5, 1.0, or 1.5% per day for five days. The cell growth, salinity level, residual nitrate concentration, CO2 fixation rate, and lipid content were monitored during salinity-gradient operations. In Figure 7 and Table 5, it is clear that the stepwise addition of sea salt rapidly enhanced the lipid content without significant inhibition of cell growth. This resulted in higher lipid productivity, especially for the treatment supplying a smaller amount of sea salt (an increment of 0.5% sea salt per day). The maximum lipid productivity (223.2 mg L-1d-1) and lipid content (59.4%) were obtained when the salinity gradient was operated at an increment of 0.5% per day. This performance is much higher than that obtained from our batch system (158.9 mg L-1d-1) or two-stage operation system (183.9 mg L-1d-1). The maximum lipid productivity obtained from optimal salinity-gradient operation was also significantly higher than that obtained from most related studies (in the range of 51.0 to 140.8 mg L-1d-1; Table 6). Time course profiles of biomass concentration, nitrate concentration, and lipid content during growth of Chlamydomonas sp. JSC4 before and after gradient operation with (a) 0.5%, (b) 1.0%, or (c) 1.5% sea salt. Error bars indicate standard deviation of three replicated experiments. (Light intensity = 200 μmol m-2 s-1; CO2 aeration = 2.0%; CO2 flow rate = 0.05 vvm). DCW, dry cell weight. To date, no studies have investigated a gradient operation strategy utilizing the salinity effect for the enhancement of lipid content and lipid productivity and only a few reports have mentioned that salinity adjustment in a batch system can increase lipid accumulation [14, 31, 44, 48]. This study demonstrated that the combined effect of high salinity stress and nitrogen depletion can indeed increase the lipid production performance and that an increasing gradient of salinity led to a much higher lipid productivity of 223.2 mg L-1 d-1 compared to conventional batch and two-stage operations. Moreover, as indicated in Table 7, the FAs resulting from the salinity-gradient operation was mainly composed of saturated and monounsaturated FAs, which accounted for approximately 60% of the total fatty acid methyl esters (FAMEs). This lipid composition, which is similar to that obtained in batch and two-stage cultivation systems, is suitable for biodiesel production. Therefore, strain JSC4 cultivated under optimal salinity-gradient operation appears to provide both high lipid productivity and good lipid quality. Therefore, in addition to the conventional engineering strategies used for stimulating lipid accumulation, such as nutrient deficiency, this study offers a new way to increase the lipid productivity of microalgae using a fairly simple but effective method. This work integrates metabolic profiling and biochemical engineering approaches to demonstrate a feasible and effective technology able to greatly enhance the lipid productivity of the marine microalga Chlamydomonas sp. JSC4. The information obtained from metabolic profiles suggested that levels of the key metabolite G3P are very high under salt stress, which could be why lipid accumulation is promoted. Moreover, enhancement of G1P levels under salt stress was observed with competition between lipid and carbohydrate synthesis. The engineering studies showed that by appropriately combining the stresses of salinity and nitrogen depletion, lipid accumulation of the microalgal strain can be significantly improved. In particular, application of an innovative salinity gradient, when combined with nitrogen depletions, could significantly increase the lipid content and lipid productivity of strain JSC4 to 59.4% and 223.2 mg L-1d-1, respectively, which are higher than most previously reported values for both freshwater and seawater microalgal strains. The lipids produced by strain JSC4 were mainly composed of saturated and monounsaturated fatty acids, which are very suitable for biodiesel production. The microalga used in this study was Chlamydomonas sp. JSC4, which was isolated from a coastal area of southern Taiwan. The 18S rDNA sequence of this strain has been deposited in the NCBI GenBank database (with an accession number of [KF3:83270]). The medium used for its pre-culture was Modified Bold 3 N medium (4.4 mM NaNO3, 0.22 mM K2HPO4, 0.3 mM MgSO4 · 7H2O, 0.17 mM CaCl2 · 2H2O, 0.43 mM KH2PO4, 0.43 mM NaCl; the levels of metals in the medium were the same as those described in Berges et al. ). The microalga was routinely grown at between 26 to 28°C for five to six days with a continuous supply of 2.0% CO2 at an aeration rate of 0.05 vvm. The culture was illuminated continuously with a light intensity of approximately 150 μmol m-2 s-1. The light intensity was measured by a Li-250 Light Meter with a Li-190SA pyranometer sensor (Li-COR Inc., Lincoln, Nebraska, United States). The PBR used in this study was a 1 L glass vessel (15.5 cm long and 9.5 cm in diameter) equipped with external light sources (DURAN, Mainz, Germany). The microalga was grown in the PBR on five different media; namely, Modified Bold 3 N medium , Modified Bristol 1/2 N medium , BG11 1/4 N medium , and basal medium 1/3 N . The JSC4 strain was pre-cultured and inoculated into the PBR with an inoculum size of 90 to 100 mg L-1. For batch cultures, the microalga was cultivated at 27 to 28°C, pH 6.5 to 7.5, at an agitation rate of 300 rpm under a light intensity of approximately 200 μmol m-2 s-1. As the sole carbon source, 2.0% CO2 was fed into the microalgal culture continuously at an aeration rate of 0.05 vvm. Liquid samples were collected from the sealed glass vessel at designated time intervals to determine the microalgal cell concentration, pH, and residual nitrate concentration. The amount of CO2 reduction was determined by measuring the difference between the CO2 concentrations in the influent and effluent streams of the PBR via a GM70 CO2 detector (Vaisala, Tokyo, Japan). The two-stage cultivation system was set up in a single PBR containing a 1 L microalgal culture. The operation was started with a batch culture at 2% sea salt (Sigma-Aldrich Co., St. Louis, United States) and 2.0% CO2 aeration at a feeding rate of 0.05 vvm. When the nitrogen consumption was over 95%, different amounts of sea salt were added to the broth until it reached a sea salt concentration of 3, 5, or 7%. Liquid samples were collected from the sealed glass vessel at designated time intervals to determine the microalgal cell concentration, pH, and residual nitrate concentration. The stepwise salinity-gradient cultivation system was set up in a single PBR containing a 1 L microalgal culture. The operation was started with a batch culture at 2% sea salt and 2.0% CO2 aeration at a feeding rate of 0.05 vvm. When the nitrogen consumption was over 95%, the system was switched to stepwise mode with an incremental increase in the sea salt level of 0.5, 1.0, or 1.5% per day for five days. As the sole carbon source, 2.0% CO2 was fed into the culture continuously at 0.05 vvm during the course of the stepwise culture. Liquid samples were collected from the sealed glass vessel at various sea salt addition intervals to determine the microalgal cell concentration, pH, and residual nitrate concentration. The microalgal cell concentration in the PBR was regularly determined by measuring the optical density at a wavelength of 682 nm (denoted as OD682) using a UVmini-1240 UV/Vis spectrophotometer (Shimadzu, Kyoto, Japan) after proper dilution with deionized water (EMD Millipore, Darmstadt, Germany) to give a range of measurement between 0.1 and 0.9. The dry cell weight (DCW) of the microalgal biomass was obtained by filtering 50 mL aliquots of culture through a cellulose acetate membrane filter (0.45 μm pore size, 47 mm diameter) (EMD Millipore, Darmstadt, Germany). Each loaded filter was freeze-dried until the weight was invariant. The dry weight of the blank filter was subtracted from that of the loaded filter to obtain the microalgal DCW. The OD682 values were also converted to biomass concentration via appropriate calibration between OD682 and DCW, and the conversion factor was determined as 1.0 OD682 equaling approximately 0.7 to 0.8 g DCW L-1. Nitrate concentration was determined according to the modified method reported in our previous study . Each sample collected from the PBR was filtered with a 0.22 μm pore size filter and then diluted 20-fold with deionized water. The residual nitrate content of the diluted samples was determined according to the optical density measured at a wavelength of 220 nm (OD220) with appropriate calibrations. The conversion factor was determined as 1.0 OD220 equaling approximately 389.3 mg nitrate L-1. where ΔX is the variation in biomass concentration (mg L-1) within a cultivation time of Δt (d). where Pbiomass is the biomass productivity (mg L-1d-1) described above. The typical molecular formula of microalgal biomass, CO0.48H1.83N0.11P0.01,  was used in this study. where CCO2,influent and CCO2,effluent are the concentrations of CO2 in the influent and effluent streams, respectively. After allowing an appropriate time for nitrogen consumption (zero to seven days of nitrogen depletion), the microalgal cells were harvested from the culture medium by centrifugation (7000 rpm for 2 minutes). The cells were washed twice with deionized water, lyophilized, and weighed. The lipid composition was determined as FAMEs following direct transesterification of lipids using the method described in Ho et al. . The FAMEs were analyzed by gas chromatography-mass spectrometry (GC/MS) on a GCMS-QP2010 Plus instrument (Shimadzu, Kyoto, Japan). Samples were injected into a DB-23 capillary column (60 m, 0.25 mm internal diameter, 0.15 μm film thickness; Agilent Technologies, Palo Alto, California, United States). Helium was used as the carrier gas with a flow rate of 2.3 mL min-1. The temperatures of the injector, ion source, and interface source were set at 230, 230, and 250°C, respectively. The oven temperature was initially set at 50°C for 1 minute, increasing from 50 to 175°C at a heating rate of 25°C/min, then from 175 to 230°C at a heating rate of 4°C per minute, and held at 230°C for 5 minutes. The purified FAMEs were identified based on retention time and the pattern of fragmentation by electron impact analysis. Supelco 37 Component FAME Mix (Sigma-Aldrich Co., St. Louis, Missouri, United States) was utilized as a quantitative standard and pentadecanoic acid (Sigma-Aldrich Co., St. Louis, United States) was used as an internal standard. Cell sampling was performed according to our previously reported method  with minor modifications. Microalgal cells, equivalent to 5 to 10 mg dry weight, were removed from cultivation vessels and added into 4-fold volume of pre-chilled quenching solution (–30°C) which was Modified Bold 3 N medium containing 32.5% methanol, then filtered using 1 μm pore size Omnipore filter disks (Millipore, Massachusetts, United States). After washing with 20 mM ammonium bicarbonate pre-chilled to 4°C, cells retained on the filters were immediately placed into 1 mL precooled (–30°C) methanol containing 12.4 μM piperazine-1,4-bis(2-ethanesulfonic acid) as the internal standard for mass analysis. Intracellular metabolites were extracted using a cold 10:3:1 (v/v/v) methanol: chloroform: water solution, as described previously . Cells were suspended by vortexing and then 1 mL of the cell suspension was mixed with 100 μL precooled (4°C) water and 300 μL chloroform. The cell suspension was shaken at 1200 rpm in a model MBR-022UP incubator (TAITEC, Saitama, Japan) for 30 minutes at 4°C in the dark before centrifugation at 14 000 g for 5 minutes at 4°C. Next, 980 μL of the cell extract obtained as the supernatant was transferred to a clean tube. After adding 440 μL water, aqueous and organic layers were phase-separated by centrifugation at 14 000 g for 5 minutes at 4°C. After filtration through a Millipore 5 kDa cut-off filter (Millipore, Massachusetts, United States) for the removal of solubilized proteins, the aqueous-layer extracts were evaporated under vacuum using a FreeZone 2.5 Plus freeze dry system (Labconco, Kansas City, Missouri, United States). Dried extracts were stored at –80°C until analysis by CE/MS. The metabolites were determined through the CE/MS method described in Hasunuma et al. . Dried metabolites were dissolved in 20 μL Milli-Q water (EMD Millipore, Darmstadt, Germany) before analysis. The CE/MS experiments were performed using an Agilent G7100 CE system, an Agilent G6224AA LC/MSD time-of-flight (TOF) system (Agilent, Santa Clara, United States), and an Agilent 1200 series isocratic HPLC pump (Agilent, Santa Clara, United States) equipped with a 1:100 splitter for delivery of the sheath liquid. Agilent ChemStation software (Agilent, Santa Clara, United States) for CE and MassHunter software (Agilent, Santa Clara, United States) for the Agilent TOFMS system were used for system control and data acquisition, respectively. The analytical conditions for anionic metabolite analyses were as described previously . The CE separations were performed in a fused silica capillary (1 m × 50 μm i.d.) filled with 50 mM ammonium acetate (pH 9) for anionic metabolite analyses. The CE polarity was such that the electrolyte vial (inlet) was at the anode, and the electrospray ionization (ESI) probe (outlet) was at the cathode. Samples were injected into the CE system at a pressure of 50 mbar for 30 seconds. The voltage applied to the CE capillary was set at 30 kV, with a ramp time of 0.3 minutes. For anionic metabolite analyses the electrolyte was passed through the capillary using an air pump and was delivered at a pressure of 10 mbar from 0.4 to 30 minutes and 100 mbar from 30.1 to 49.5 minutes. The flow rate of the sheath liquid was set at 8 μL min-1. The ESI-MS analyses were conducted in either the positive or negative ion mode using a capillary voltage of –3.5 or 3.5 kV, respectively. The TOF-MS fragmenter, skimmer, and Oct RFV were set to 100, 65, and 750 V, respectively. The flow of heated drying nitrogen gas (300°C) was maintained at 10 L min-1. Mass data were acquired at a rate of 1 spectrum s-1 over the mass-to-charge ration (m/z) range of 70 to 1000 m/z. This work has been supported through project P07015 by the New Energy and Industrial Technology Development Organization (NEDO). SHH performed and operated all experiments and drafted the manuscript. AN assisted to perform and analyze the metabolic experiments. XY contributed to the manuscript draft. JSC served as critical reviewer of the manuscript. KH contributed to advice the content of the manuscript. TH and AK coordinated the study and helped in drafting the manuscript. All authors read and approved the final manuscript.